With this show, Swiss artist Heidi Bucher (1926-1993) finally returns to the United States, her works on exhibit outside of Europe for the first time in 40 years. Given her prolonged absence, the Swiss Institute doesn’t skimp, presenting an overview of the artist’s career alongside documentary videos and other assorted archival materials. Bucher moved to California in the 1960s, where she lived until her return to Switzerland in the mid-70s. While in the United States the artist produced the “Bodyshells,” a series of wearable sculptures, with then-husband Carl Bucher; plush and oversize, the sculptures bring to mind geometric abstractions of household items like shalt shakers and flower pots, and were exhibited at the Los Angeles County Museum of Art in 1972. 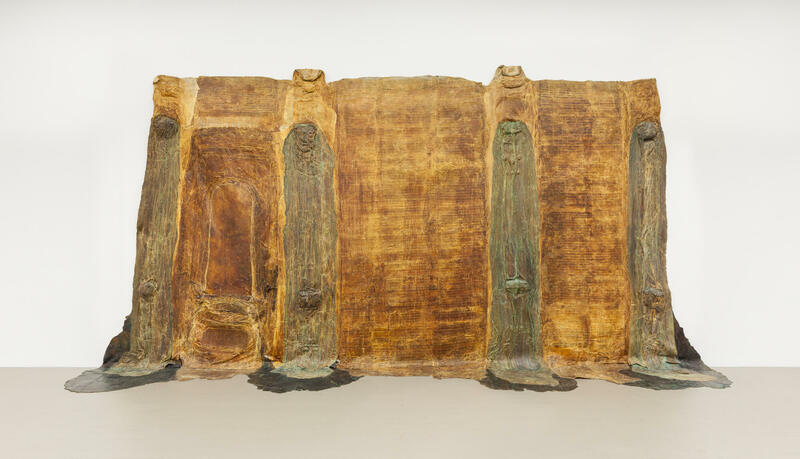 Once back in Europe, however, Bucher began to make her Raumhaüte (room skins), her best-known works, casting architectural elements in latex and producing immense moldings ingrained with a patina of the original objects’ dust and grime. At the Swiss Institute, it’s the Raumhaüte that are most memorable. After passing through the lobby, where a wood-and-mother-of-pearl model of a house that served as a study for later works stands alongside a vitrine displaying printed matter featuring the “Bodyshells” (no longer extant outside of such documentation), one is greeted in the expansive main gallery by Untitled (Herrenzimmer), undated. For this approximately 8-foot-wide Raumhaut of the master bedroom of Bucher’s parents’ 19th-century house, three casts are imprinted by impressive detailing, the walls’ panels and trim clearly apparent. The baroque architecture is rendered spectral, however, by the casts’ display—though separated from each other, they’re arranged to form a partial outline of the bedroom, etherally floating in midair by means of wire—and by the semitranslucence of the yellowing latex. In contrast to this work’s negation of materiality, Grande Albergo Brissago (Entrance), 1987, possesses an exaggeratedly physical, almost earthy presence. Exhibited here for the first time in an institutional context, the casting of the entry of a hotel in the Swiss town of Brissago resembles its source material less directly than the other Raumhaut on view. Heavily soiled in comparison (due to the entry’s exposure to the outdoors, one assumes), the piece is dominated by four flattened, greenish gray columns. Sandwiched between two of them is the impression of the door, discernible as such mainly by a handle that juts out. Attached directly to the wall with its bottom pooling on the floor, the slumping Grande Albergo Brissago brings to mind a lava flow, the columns like channels of ash. Between that work and Untitled (Herrenzimmer), Bucher’s art comes across as a kind of mix between Do Ho Suh, Rachel Whiteread and Claes Oldenburg: able to both create haunting, phantomlike embodiments of architectural memory and transform the fixed contours of everyday objects into something pliant and malleable. Alongside a number of small sculptures (houses in miniature, castings of desk drawers) in the main space, seven videos documenting Bucher’s performances and working process round out the exhibition in the gallery’s basement. The performances often see the Raumhaüte set in motion—a crane sends an intact casting of a room soaring into the sky in a particularly beguiling moment—but the images of Bucher at work are equally captivating. Watching her struggle to tug the casts free from the surfaces of a room, the latex resisting at first but eventually peeling off in vast swaths, one is struck by the singularly visceral nature of her practice, the artist wrenching history from the very walls.